Lead heavy guitar, saxes would sound good anywhere. One for the Afghan mosh pit. 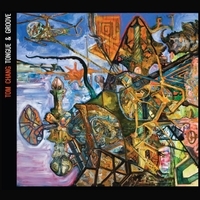 "Spinal Tap / Goes to 11" is the explosive opening track on guitarist Tom Chang's new CD "Tongue & Groove." Out June 3, 2014 on Raw Toast Records. Greg Ward: alto sax; Jason Rigby: tenor sax; Chris Lightcap: bass; Gerald Cleaver: drums; Akshay Anatapadmanabhan: kanjira and mridangam; Subash Chandran: konnakol.